This entry was posted in A Wounded Heart, Characterizations, Choices, Courage, Dreams, Endurance, Freedom, Healing, Hope, Living in the Light, Nature, Poetry, Seasons, Snow, Strength, Winter and tagged allegory, blizzard, digging, free verse poem, hard work, hope, life, light at the end of the tunnel, photography, poem, poetry, recovery, shovel, wild horses, winter. Sometimes a dark cold hole is comforting. I love your work. Thanks Shelli. I appreciate that…. It’s actually a privilege to participate in the freeing process – what little we can do seems to work some amazing things within us as we see God at work in our troubles. 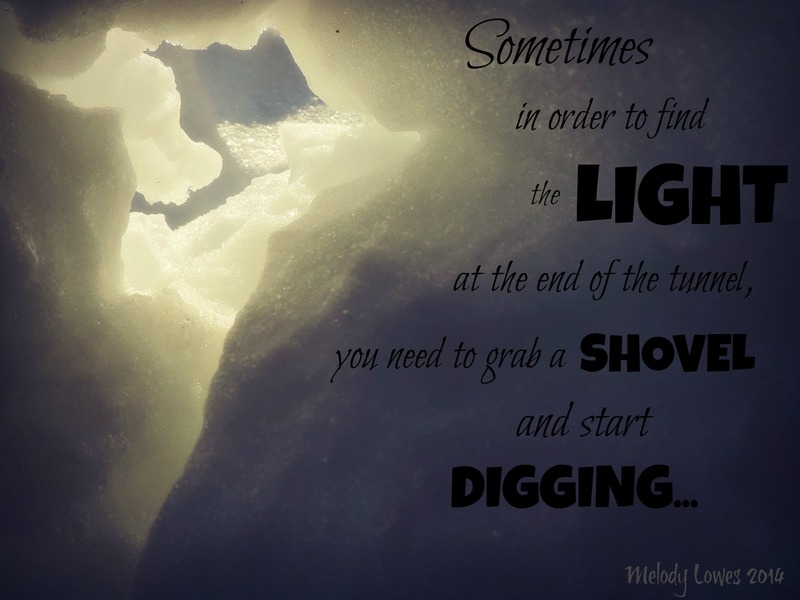 Digging for the light – not for the faint of heart or the claustrophobic. As long as the will is there, the human heart will always seek and find the light. Yes? powerful images and even more powerful message – great work, Melody!